Attention Previous CSO Student Leaders! Now is your chance to gain advanced leadership experience and make CSO even better! Applications are now available and being accepted for CSO 2019 Leadership Positions. CSO is an August Adventure service-learning experience for incoming, first year students, and an excellent introduction to the spirit of service and putting the Benedictine Values into action. The Benedictine Value of Community teaches us that great good comes from helping others in need. CSO is the perfect opportunity for students to serve the local community, learn about various social issues, build community, develop new friends and HAVE FUN! Participants move in about a week before classes start and spend time getting to know other freshmen, some upper class men and women and the CSS/Duluth community through service and social justice activities. 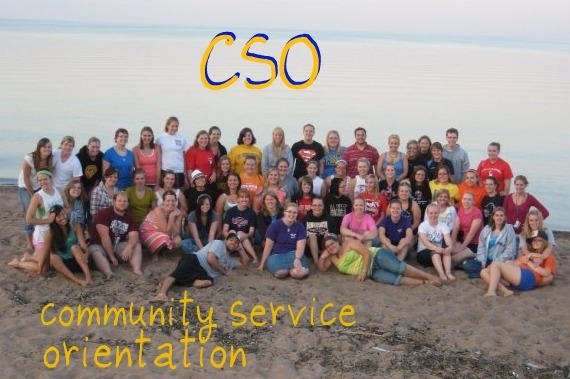 What to expect during CSO: During CSO, students participate in a variety of service around the community. In the past, some of the service projects have been: building a fence, helping out at the Lake Superior Zoo, weeding the gardens at Hartley Nature Center, visiting the animal shelter, playing with kids and helping out at a boys and girls club, and much more! Students have the opportunity to serve the Duluth community while making friends, learning more about the area, and exploring St. Scholastica before move in day! Students also have the opportunity to explore the Duluth area through a variety of group activities after a long day's hard work. Student Leaders Needed: Want to be a student leader for CSO? Each year we need approximately 10-15 current CSS students to serve as student leaders for CSO. Applications are available each year in January. Email VITA for more information.